WEIGHT: Standard duty racks are rated at 12,500 pounds per wheel. Heavy duty racks are designed to meet your largest equipment needs. RAMPS: Drive thru systems (ramps on both ends) or drive on – back off wash rack platforms are available. TROUGHS: Conveyor troughs are available for automatic removal of solids from the wash rack system. No shoveling or pumping of sump pits necessary. The standard rack has a 2’ wide trough with removal grates. WALLS: Six or twelve foot walls are standard, but are available in any size. PAINTED or GALVANIZED: Standard racks are constructed of heavy duty steel and epoxy grit coated. If you are located in a highly corrosive environment such as Hawaii, Guam or coastal environment consider a 100% galvanized wash rack for maximum rust protection. CANOPY: A wash rack canopy is available to provide cover from rain, sun and other elements. Wash racks can be designed for any size equipment and use. As small as 7’ x 7’ and as large and wide as needed to contain your wash water. Racks are engineered and rated to hold the largest tracked and wheeled equipment in the world. 14’W x 24’L Medium Wash Rack with 12’ overspray walls. Wash rack is used to clean floor sweeper equipment. System features RTS 500 filtration system and pressure washer. 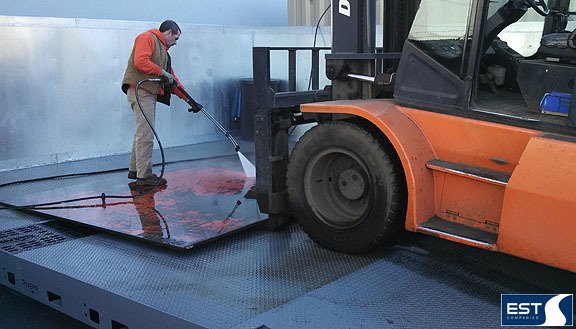 QSSII degreaser is applied using pressure washer and is safe for use with closed loop filtration system. 18’W x 70’L Large Wash Rack with 12’ overspray walls and ramps on both ends. Wash water and containments from oil field trucks and fracking rigs are 100% contained to the wash pad. They are recovered for filtration to be reused or discharged per state and local discharge standards. Small Wash Racks, with or without ramps, can be used to place parts and equipment on the containment pad for washing. They can be equipped with a pressure washer, phosphate system, filtration system for closed loop operation or evaporator. 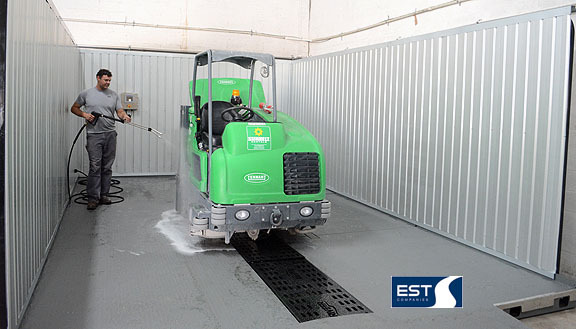 Wash Racks / Wash Pads can be built as a drive through configuration with ramps on both ends, or as a drive on – back off configuration based on customer's site plan. Overspray walls are available in 6’ or 12’ heights. Drive Through Wash Rack. Wash rack is 18’W x 42’L wash rack with mud removal conveyor system, Containerized RTS 3000 filtration system, 3000 PSI wash rack pressure washer, 30 GPM de-mucking water cannon and foamer gun with QSSII wash rack soap. Drive On / Back Off Wash Rack. Wash rack is 18’W x 53’L with 6’ overspray walls, mud removal conveyor system, closed loop RTS 5000, pressure washer, 25 GPM water cannon and solar generator system for power. Standard Wash Racks are constructed of heavy duty steel and diamond plate tread to create level non-slip, non-trip surface. Standard racks are finished with a corrosion resistant grit epoxy coat for long lasting durability. 100% galvanized steel wash racks are available, and recommend in Hawaii and Guam to increase durability and lifespan on the wash rack surface. 100% Galvanized Wash Rack. 18’W x 30’L wash rack is 100% galvanized for corrosion protection. This wash rack system features a RTS 1000 closed loop filtration system constructed of stainless steel. Standard Epoxy Coated Wash Rack. Wash rack surface is grit epoxy coated surface. The surface contains no trip hazards and makes driving equipment onto rack easy. Wash rack platform is only 7” high for a low breakover point when driving up ramps. Wash rack canopies are available to provide cover from rain, sun and other elements. Conveyor troughs are available for automatic removal of solids from the wash rack system. No shoveling or pumping of sump pits necessary. The standard rack has a 2’ wide trough with removal grates. Standard duty racks are rated at 12,500 pounds per wheel. Heavy duty racks are designed to meet your largest equipment needs. Six or twelve foot walls are standard, but are available in any size. Heavy Duty Weight Wash Rack. 18'W x 35'L wash system with 6' overspray walls. Closed loop filtration for washing cranes. Standard Weight Wash Rack. 14' W x 16'L wash rack with solids conveyor, drive through configuration with 6' overspray walls. Closed loop filtration for washing golf course equipment and vehicles. Shovel Trough Wash Rack. 18'W x 35'L wash rack system, center shovel trough and 6' overspray walls. Closed loop filtration system with hot water 4000 PSI pressure washer. Above Ground Wash Racks can be designed and built to meet any size or configuration. Modular wash rack sections allow the wash rack to be configured to any piece of equipment. 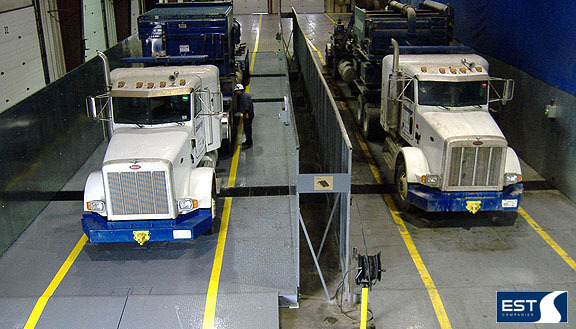 From small parts washing to tracked vehicles and large aircraft, these wash rack systems can handle the job. National Parks Service Wash Rack. Automatic sides conveyor system, 18'W x 42'L wash rack. Closed loop RTS 300 filtration system, pressure washer, water cannon with integrated hose reels. Rental Equipment Wash Rack with 12 ' overspray walls. 14'W x 23'L wash rack. RTS 500 filtration system with pressure washer. 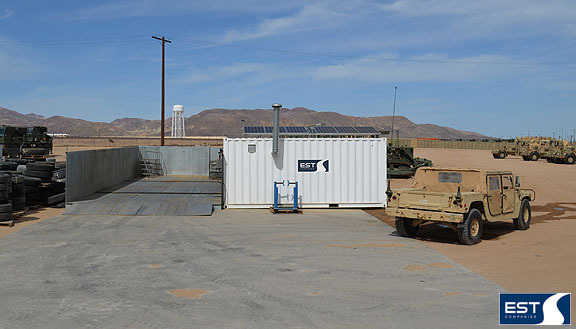 US Army Solar/ Off The Grid Wash Rack System. Six foot overspray walls, 18'W x 56'L with two solids removal conveyors. RTS 5000 filtration system. Pressure washer water cannon with automatic thunder spray system. Rental Equipment Wash Rack System. 18'W x 23'L wash rack, RTS 3000 water treatment system. Pressure washer, water cannon, Canopy 14' sides, 18' center. EST is in the business of SOLUTIONS, partnering with companies to include SALES, TRAINING, SUPPORT & SERVICE.